Hi! I'm Holli and I'm the founder and artist at Fritz's Stitches. 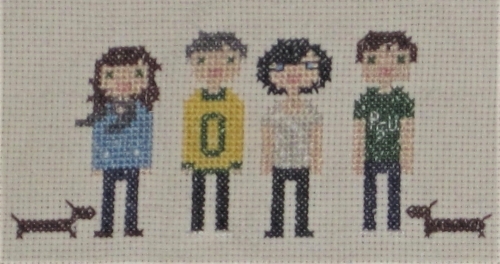 I have been immortalizing people and their pets in cross stitch since 2011. I still get excited as each figure comes to life with their unique details and personalities. When I'm not cross stitching, I can be found spending time with my husband and fur-babies, teaching high school mathematics, playing slow-pitch softball, listening to podcasts, forcing my mother to listen while I tell her about all my podcasts, and being amazed by all the beauty in the Pacific Northwest. Fritz is a dog with a small body but a lot of heart. He's brought joy to my life everyday since I rescued him back in 2008. He enjoys cuddling, barking at all the things, canoeing, digging, sunbathing and rearranging blankets. My life and home wouldn't be complete without my husband, Travis, and our other animals: Oliver and Walter. Travis lives and breathes hockey and anything Oregon State, Oliver is obsessed with his automatic ball machine and is scared of crows, and Walter loves BBQ chips and sleeping in his 'catio'.